A total renovation has just been completed on this condo. Most desireable 4th floor unit with un obstructed breath taking views of the Gulf. This unit has been completely remodeled with new tile & carpet, brand new CUSTOM KITCHEN with granite counter tops & custom lighting. Microwave, coffee maker, dishwasher, all cookware, & washer and dryer are included. New bathrooms with marble shower. THIS IS THE NICEST UNIT AVAILABLE FOR RENT AT THE SUMMIT. The master bedroom has king-sized bed in addition to a queen sleeper sofa in the living room and 2 bunk beds recessed in the hall. There are 2 brand new 39' LED TV's, DVD player, private phone and all linens are included. 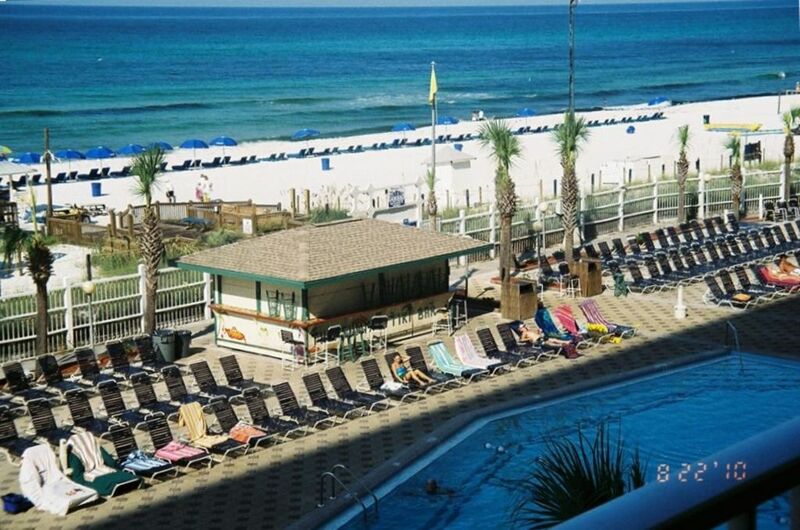 This Panama City Beach Condo at ' THE SUMMIT ' has everything you need for A PERFECT FAMILY VACATION including private balconies, 2 pools, 2 kids pools, hot tubs, fitness center, tiki bar, Bikini Bobs restaurant , tennis courts, laundry facilities, security, and walking distance to restaurants, amusement parks, The Spiniker and Club La Vella. Cable T.V. Washer and Dryer, Free wireless internet connection. It was our first visit to Panama City, and we enjoyed our stay in this condo very much! The sounds and views from the balcony were beautiful, and the layout of the comfy living space was just perfect for our family of four. The kitchen had all the utensils and appliances we needed (and then some) and was quite lovely as well. Rick was great to work with and his suggestions about things to do and places to eat were spot-on! The resort felt secure, was conveniently located and overall had a lot to offer. Be sure to try Bikini Bob's while you're there! We'd stay there again in a heartbeat! I have worked hard to make my condo one of the nicest units available for rent at the Summit. The fact that it is my second home and not just a rental unit has made it much more enjoyable for the families that rent from me. I take real pride in accommodating my renters to the fullest and really appreciate the people that enjoy spending their vacations in my condo. Thanks for the rental and look forward to you and your family renting from me many years to come. Just returned from a week stay at the Summit. Was a little worried about it being so big but being on 4th floor was very convenient. We used the stairs most of the time. Bikini Bobs had great food and drinks. Two large pools so not too crowded. Within walking distance of golf and restaurants. Very good security. The room itself was very nice. Kitchen well stocked. Great view of ocean from balcony. . The only thing negative I can say is the dryer is for small loads (which is stated) but it seriously would only dry about 1 towel at a time. May not be a big deal to some. Would definitely stay here again and recommend it! Thanks Rick for a wonderful vacation. I have stayed at the Summit for more than 30 years and for the first time ever actually rented a condo that was extremely nice. This condo is by far all that everyone has said about it. Great location and furnished very nice. The bed was excellent to sleep on as I felt I was at home in my own bed when retiring for the night. Perfect height for viewing the beach and water and very accessable. The landlord (Rick) was extremely nice to speak with and very accomadating. We had absoultly no problems and the week was the best I have ever had in Panama at the Summit. I would recomend this unit to anyone who wanted to have a very nice place to relax and truly enjoy their time on vacation. I am looking forward to renting the same condo for the next several years. OUTSTANDING R & R vactaion well needed. My family and I stayed in Rick's condo in July of 2015. We could not have been more pleased. The unit was clean and well stocked of all the items we needed. The fourth floor is just high enough to have a wonderful view of the ocean, but not too high to take the stairs. I look forward to renting this unit again. Once again, Thanks Rick! Thanks for the great review. We really appreciate families that enjoy our 2nd home. I Look forward to you spending your next vacation with us. This review is long overdue but better late than never! My husband and I have stayed at the Summitt over a decade and this 4th floor unit is the most incredible place on the beach . Not only was the condo first class but owner themselves were too. We will NEVER stay anywhere else again ! Let me start by saying the pictures do not do this condo justice! This condo is modern (which is a huge plus), fresh, and newly decorated. We have stayed at some of the newer condos, where traffic is absolutely aggravating, and this unit is just as nice if not nicer than others we have stayed in. The unit is just the right size for a family of four. We stayed 6/7-6/14/14 and could not have asked for better weather! The view from the fourth floor is amazing! You're not up too high, so you can still enjoy the sounds of the ocean waves crashing against the shore. No need to worry with the elevators when you're on the fourth floor either, but when we did use them we never had a problem getting one. There were always plenty of chairs by both of the huge pools. The grounds are beautiful and well kept. The Summit plenty secure with security guards at every entrance. Bikini Bobs is an onsite restaurant with great burgers and fries and just about as cheap as McDonald's! The owner was always available by phone and I am so thankful that he was able to work with me so quickly for our last minute trip to PCB. Thank you for allowing us to stay in your beautiful condo and we hope to return again soon! Rates are based on 4 people staying in the condo. Additional charges will apply for over 4 guests.